I can’t eat mac and cheese without burying it in ketchup. It’s just about the only thing I ever eat ketchup on. Hmm. That isn’t really relevant to the Stouffer’s vs. Michelina’s debate, is it? Sorry. That’s okay Dave, we’re here for all your snacking thoughts 🙂 I do think that’s interesting though. I know it’s not uncommon but I don’t know anyone who puts ketchup on their m&c. Hot sauce, but not ketchup. I’ll give it a try! Howard Johnson’s food products were sold off in the early 2000’s, and apparently have been sold/distributed to various food makers of dubious financial stability. I miss their mac n cheese, too (an occasional treat), and especially the blueberry toasties – those were my husband’s favorite! If you want some interesting reading, visit hojoland.com for the Howard Johnson’s restaurant history. Thanks Dave. At least I’m not the only one. I like to brown hamburger and add it to my mac & cheese along with a little ketchup. You’re not alone Dave. Oh, geez, I couldn’t get over “vomit fest” in the intro. Anyway… I have tried both. I prefer Stouffers. Oh, and long time reader… first time commenter, I think. Love the blog. Keep up the good work. Crazy for Stouffer’s in college. Consumed thousands. Today, they kind of pricey at $2.37 to $2.99 depending on where you buy them. Michelina’s is usually 5 boxes for $5.00. So they’re half the price! Possibly even less. So, at a buck a box how can you really go wrong? Sure Stouffer’s is creamier, cheezier and better tasting…but saving so much money I quickly changed to Michelina’s. And now I’d never go back to Stouffer’s… Never. Way too expensive compared to Michelina’s. In fact, Michelina is such a success at some stores that they had to take it off the shelf because the Stouffer’s doesn’t sell. This really makes me mad too. Stouffer’s is using their power and leverage from other frozen products to keep Michelina from moving in as a better value. I say buy Michelina’s until Stouffer’s lowers their price. I love Stouffer’s. It’s so cheesy and tastes homemade. I like all the sauce too. I feel like this review is a bit biased because how could you approach a food you barfed up a dozen times and not automatically dislike it a little bit? I rarely get sick, but the past 3 times (over 20 years! ), it has been after eating spaghetti. Each time I couldn’t eat spaghetti for about 2 years after and wouldn’t have been able to judge it fairly. I didn’t get sick because the spaghetti was bad either, it was just that I ate a lot of spaghetti growing up! 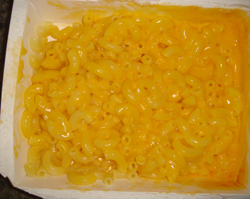 Might I suggest Trader Joe’s – Joe’s Diner Mac & Cheese … it will make you smile. To be honest, I don’t like the look of that. Reminds me of something. If you don’t like ketchup try a little salsa on your Mac And Cheese, it is pretty good. I will probably never by Michelina’s again. Bought two Cheeseburger Mac packages. Mac and Cheese tasted fine, sauce was alright neither too much or too little. But the sausage. What Sausage. The first package I prepared had 1 little piece of hamburger half the size of my pinkies finger nail. The second package, Nada, nil, none. Not one scrap of hamburger. As I said I’ll never buy the product again. Stouffers: Stank, I know it is cooked cheese but it was too strong for my liking. I didn’t like the texture when eating it. The flavor was ok at best, edible. Michelinas: Amazing price. I didn’t smell a stinky odor after cooking like I did with Stouffers. The noodles were great, the sauce was good and although it could probably use a little more it covered it enough where I have no complaints. 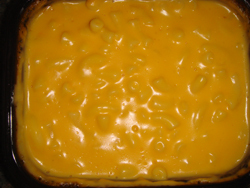 I love this Mac and cheese and will definitely be stocking up on it next time I go grocery shopping.